I recently placed an order on JetPens which included this Zebra Disposable Brush Pen. Honestly, I wasn't very excited about ordering this pen but it pushed me into the free shipping category so i got it anyway. Now that I have the pen though I'm happy I ordered it. This pen is really interesting and fun to use. The thing I was worried about with the Zebra Disposable Super Fine Brush Pen was with how it would write. I had never used a brush pen before and didn't know much about them. (I still don't). The pen surprised me though. It writes beautifully. The ink comes out jet black and stays very dark after it dries. There is minimal show through and no bleed through with this pen. This pen absolutely glides across the paper. It's a different writing experience than I have had before. It just feels different. I have heard that artists enjoy these types of pens because of the varying widths that the brush tip can produce. I'm not an artist so I can't attest to that, but the varying widths the brush tip can provide by using different amounts of pressure adds a nice unique characteristic to your writing. 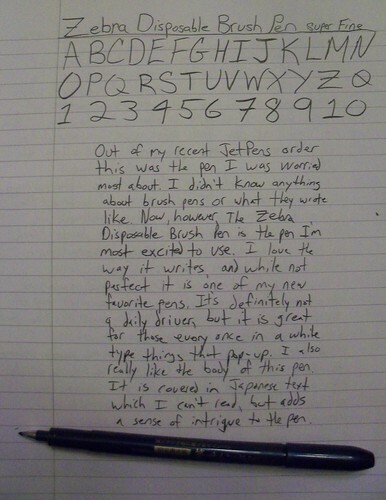 This may just be me and my horrible handwriting but it also made my handwriting seem a lot better looking. This pen isn't all positives though, there are some problems. The tip of the pen is a bit concerning to me. I have been using this pen moderately for about 2 days and signs of wear can already be seen on the tip. The tip has already changed shape and sees to have shrunk a bit. Sadly I didn't take a picture of the tip before I used it, but it happened. Also, the cap when posted is not extremely sturdy. It doesn't wobble or shake or anything like that, but it is very easily knocked off the back which can get a bit annoying. The body of this pen is super cool. It's navy blue with gold lettering, a classic color combo that never gets old for me. The body is also covered in Japanese/Chinese text which I can't read. Originally I thought it was Japanese text. However, when I looked on Zebra's international catalog this pen is listed as a Chinese Version. So I'm not positive what language the text is in. The foreign text on the body just adds a bit of mystery and intrigue to the pen, and makes it a bit more fun to use. I was not expecting much from this pen at $2.50 from JetPens, but it surprised me in a good way. Although it is far from a perfect pen it really is interesting and fun to use. The Zebra Disposable Super Fine Brush Pen is one of my new favorite pens to use. It may not be great for marathon note taking sessions, but it is great for a quick note or letter to a friend. 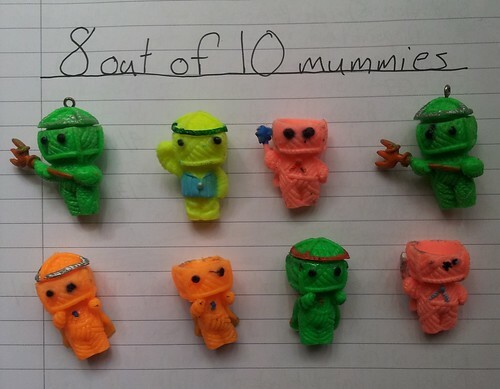 8 out of 10 mummies. Oh this is cute.. too bad it's not refillable though! The text on pen body should be Japanese.. from the glimpse of your photos.